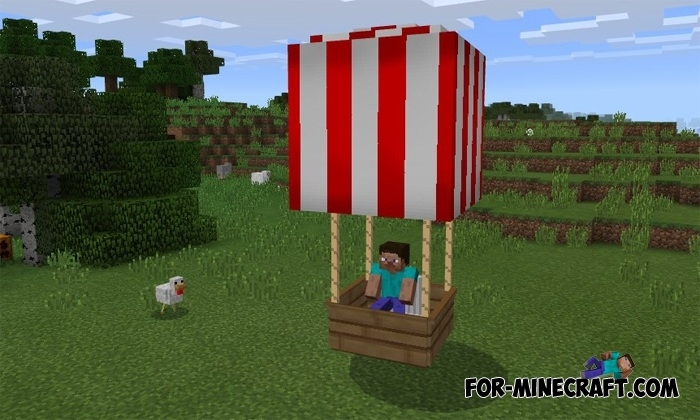 Here is a very beautiful and convenient means of transportation for Minecraft PE 1.0.6. The air balloon is not as fast as the plane, but it is suitable for quiet travel throughout the cubic world. 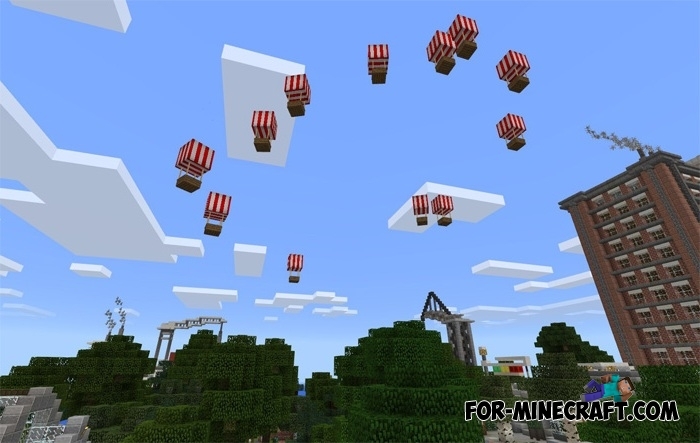 If you are a peace-loving player who likes to find villages or explore new biomes then try flying in such a balloon. It unfortunately does not make sounds and requires fuel for long flights. How to get and fly it? Alas, there is no way to find a balloon in the ordinary world. The reason is that you will need a blaze spawn egg, but it can not be found playing the survival mode. Therefore, you must set the creative mode, or use a third-party program or mods. The air balloon takes off only when you refuel it. To do this, take more eggs and throw on it. After that, the airballoon will gradually take off and reach its maximum height. After a while, the air balloon will fall to the ground so take about 30 eggs to fly. Carrot on a stick is a steering wheel that changes the direction of flight, do not forget about it. The advantages of this vehicle include its size, it takes not so much space as you might think and can perfectly fit on the lawn of your house. War Plane Addon for Minecraft PE 1.0.0/1.0.5War Plane Addon contains 4 different aircraft of the last century equipped with a fighting machine gun.. Wooden Plane for Minecraft PE 1.0.XThis time you get the opportunity to fly on a wooden plane with a propeller..